As part of doing this project, I am trying to experiment with new types of cuisines, new culinary experiments and new cultural influences in my food. I had heard quite a bit about the Chef Marcus Samuelsson, and I decided to purchase and review his new cookbook, New American Cuisine, in a series of posts over the next several weeks. Marcus Samuelsson, a well known American chef, was born in Africa (Ethiopia) in 1970 and, after tragically losing his mother at a young age, he and his sister were adopted and raised in Sweden. He currently lives in the United States, where he is currently an advisor to the Institute of Culinary Education, in New York. He came to New York in 1991 to serve as an apprentice at the Scandinavian restaurant, Aquavit, where he eventually became executive chef at the age of 24. He subsequently has published numerous books exploring his cultural and culinary roots, including a Scandinavian Aquavit Cookbook and an African cookbook. Samuelson's new cookbook, A New American Cuisine is intended to be a cross-section of the culinary influences that make up the melting pot that is America. It includes influences of his multi-cultural background, as well a mixture of the the variety of cuisines and ethnic traditions that have become part of American society. What's interesting is that his recipes aren't really German, Japanese, Ethiopian, Creole or French per se, but they often mix different culinary influences and it is this that make them distinctly American. Really, then there is no such thing as American food without adding a cup, dash and a pinch of the different ethnic and cultural traditions that make up America. We have become such a melting pot that we don't even notice it that our cuisine seamlessly mixes these influences, just like we do in our everyday lives. With that background, it is not surprising that the President invited Marcus Samuelsson to be the guest chef at his first state dinner (yes the very same state dinner that was crashed by the wanna-be reality TV stars). The link above includes a full discussion of the state dinner and menu. 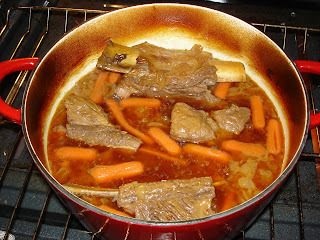 I decided to try two of his German-American Dishes: Beer Braised Short Ribs (page 277) and Caraway Pretzels (page 117). 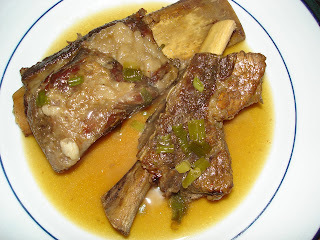 Beer braised short ribs are a dish I have been meaning to try as I am not crazy of the other short rib braises that I have tried that use a very heavy tomato sauce. Samuelsson describes his beer braised short ribs as having been influenced by the Germanic traditions he discovered in Milwaukee, but they are purely American (rather than simply German) because of the Asian influences in his recipe. First, I smeared the chile paste on the short ribs, as Samuelsson instructs, in a baking dish. I added a mixture of the beer (1 cup of beer, although he only says to use 1/2 a cup, and 1/4 cup of soy sauce). I allowed this to marinade for 4 hours, rotating the ribs once. Next, I heated the truffle olive oil and sesame oil in my Le Creuset Dutch Oven (I love Le Creuset and it is so pretty; I wish it was cheaper). I added the garlic, ginger, bay leaves and onions and sauteed. Then I added the ribs, beer, rest of the soy sauce, chicken stock and mirin and brought to a boil. We cooked for about two and a half hours at 350 F (he says 300 F but we wanted it done a little faster). After the braise was done, the ribs were removed and we prepared the sauce by mixing 2 cups of the remaining liquid with 1 T honey, 2 T soy sauce, another 1/2 cup of beer, 1 tsp salt and the butter. Then I added the scallions. The sauce was delicious with the ribs and had a beautiful color. You could taste the flavors of the beer, but without the alcohol. This was great because it didn't have the heaviness of most tomato-based braises. 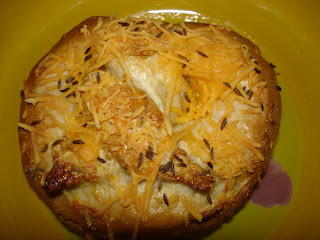 We also made his recipe for Caraway pretzels, on page 117, which are supposed to be similar to German street pretzels. These were delicious and came out perfectly the first time. First, I combined the yeast (I used more - 2 packages of 1/4 oz each, and I suggest that you do the same), water and sugars and let the yeast activate for a few minutes. Then I combined this mixture in artisan mixer with the flour and 2 1/2 tsp salt to form a dough. Samuelsson says to let this rise overnight - but I didn't want to wait that long, which is why I added the extra yeast and my dough rose just fine in about 3 hours. The I divided into 10 balls (he says 12, but I only made 10 perfectly sized pretzels). I rolled it out and shaped into pretzels after printing out a picture of a pretzel from the Internet to use as a model. Then I let them rise for about 45 minutes, as he instructs in his cookbook (they didn't change much), and then boiled in water with the baking soda, much like is done with bagels. I boiled for 20 seconds or so on each side. Before baking at 400 F for 20 minutes, I did the egg wash and sprinkled with healthy amounts of lowfat cheddar cheese and caraway seeds. 20 minutes later, the end result were some delicious German pretzels, which were a big hit. We have some friends living overseas in Germany now who are visiting for the holidays and I plan to test them on our friends tomorrow night and see how they measure up to the real thing (if my husband doesn't eat them all first!). This looks fantastic! I love short ribs!